Some of the folks out there have a US and EU focus on their data center services. Others see the double digital growth in emerging markets. Komonews reports on Boeing's 20 year forecast of airplane sales. The 20-year forecast, which Boeing puts out annually, predicts 60 percent of the demand for aircraft will come from Asia, Latin America and the Middle East. The rest comes from carriers in Europe and North America. With all that airline capacity the economic growth is there. Among the new orders, 12,820 are expected to go to the Asia-Pacific region. The next-largest market is Europe, with 7,460 deliveries. Airline consolidation in the United States has caused orders to drop sharply there - a trend that is likely to spread to Europe in coming years, Tinseth said. The double digit data center growth will happen in these markets, but it is much more expensive to build data centers in these places than the US. Could Google's investment in South African Solar Project be an early indicator of future data centers? Google has an office in Johannesburg. And just announced a solar project investment in South Africa. Most of the renewable energy projects have had an association with a data center location. Which brings up the question will there be a data center in South Africa for Google? Well maybe not one of their big ones that get reported when they are larger than 5MW (there are 14 of them), but maybe there is a smaller one. In fact, there has to be a small one. Google does have peering sites in South Africa so there is some kind of presence there. 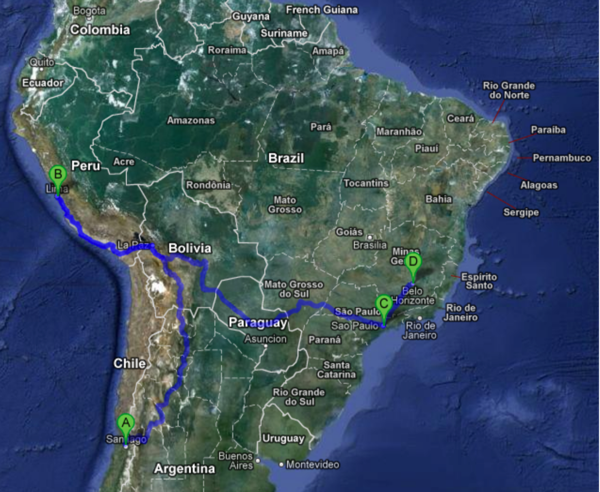 Back in Sept 2012 Google announced its fits data center build in LATAM. Making the jump from NAP of Americas to South America and being in co-location sites can only work for a limited audience. At some point you'll need MWs of data center space. I have long said to my clients that there is an world wide race to provide sub 100ms latency to everyone in the world. Google is a player and Equinix. Digital Realty Trust is building out wholesale space. Carriers are building relationships and capabilities to span the world. Netflix is expanding in emerging markets which drives demand for AWS globally as well. The WSJ covers Google's efforts in Africa and Middle East and Southeast Asia. These wireless networks would serve areas such as sub-Saharan Africa and Southeast Asia to dwellers outside of major cities where wired Internet connections aren't available, said people familiar with the strategy. One of the areas I have been watching for is when servers will show up in cell tower installations to improve the performance and latency of mobile devices. With Google's acquisition of Motorola they can create a wireless data center solution. And there is even speculation Google will launch an airborne wireless fleet. Some people may think this is new news, but there have been discussions even back in 2007 that Google was looking at wireless networks.